This isn't the typical way to celebrate lent but after talking to a friend of mine and explaining for the millionth time how deeply I loved Twilight she said that's how she felt about Harry Potter. Then she had a light bulb moment. For lent not only will we eat fish fillets at McDonald's (what catholic kid didn't do that when they had away games? ), but we shall give up pretty much everything to be involved in all consuming reading. She will read the Twilight Saga and I will tackle Harry Potter. 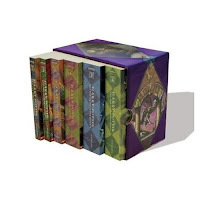 I have 7 books and she has 4 but I think it will be worth it. So instead of the typical giving up candy (though I am going to follow her lead and give up chocolate in a wrapper- she bases it on tax laws and I think that is genius) I will give up pretty much all other activities to be wrapped up in these books :) I'll see all of you in 40 days, please send my husband a pizza. 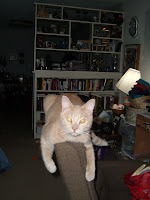 This is my furry Monster Kash, he's a softy but likes to pretend he's tough. Grandma Kurtz is turning 90 so part of her present is this blanket. This is a thistle stitch and I used Vanna's choice yarn in Dusty Purple. It worked up REALLY fast! Also I had 1 ball of yarn leftover and so I started one of my resolutions. KNITTING I'm going with this site for now http://www.knittinghelp.com/videos/learn-to-knit but I haven't figured out purling. Also I did a swatch this size like 5 times and have ripped them all out because they seem wonky to me.... maybe it's just because it isn't crocheting. So here are some random things about me! 1. I like Phil Collins and Lacuna Coil- Country, Metal, Rap, Blues, Jazz, Pop I have favorite artists in every genre. My iPod is eclectic to say the least. 2. The first time I saw my husband we were at a Megadeth Concert (he ran into a candy rack trying to sneak a peek at me at a gas station after the show). 3. I’m a descendant of Sacajawea (the guide that helped Lewis and Clark). 4. I believe Peanut butter should be its own food group (it should also not be as scary as it has been as of late). 5. In my opinion The Twilight Saga is one of the best book series ever, and yes I have read the classics. 6. When I was in 5th Grade I wanted to be a super model- then I stopped growing and stayed at my current height of 5’ 5” not really Model Runway material. But hey in 5th grade I was super tall and thin! 7. My homemade macaroni and cheese is the bomb (see the recipe a couple of blogs back). 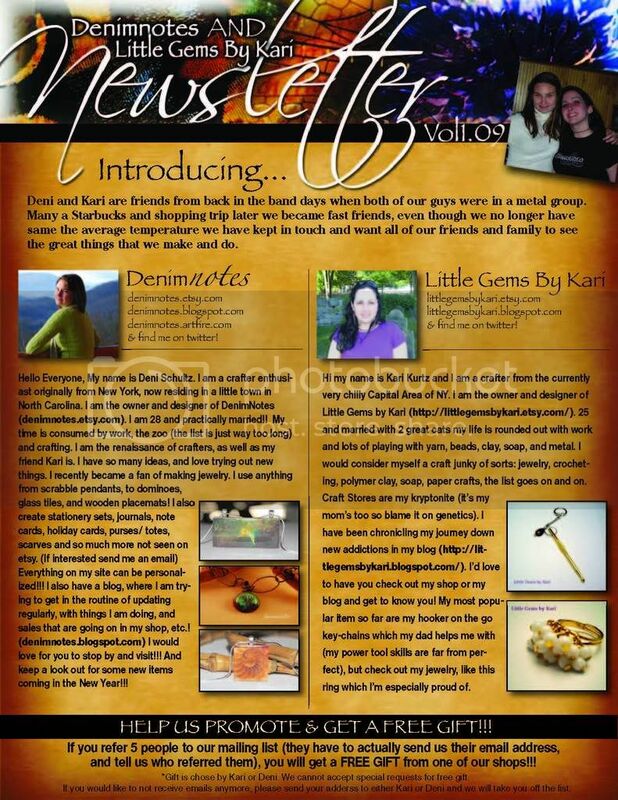 Deni of denimnotes.etsy.com and I have been working on our new newsletter! It will be a monthly publication and we'd love to add you to the mailing list!